FIRST THINGS CAME FIRST. The opening meeting agreed that a temporary Rectory should be purchased at once. When a permanent Rectory should be built, the temporary building would be placed on the market. 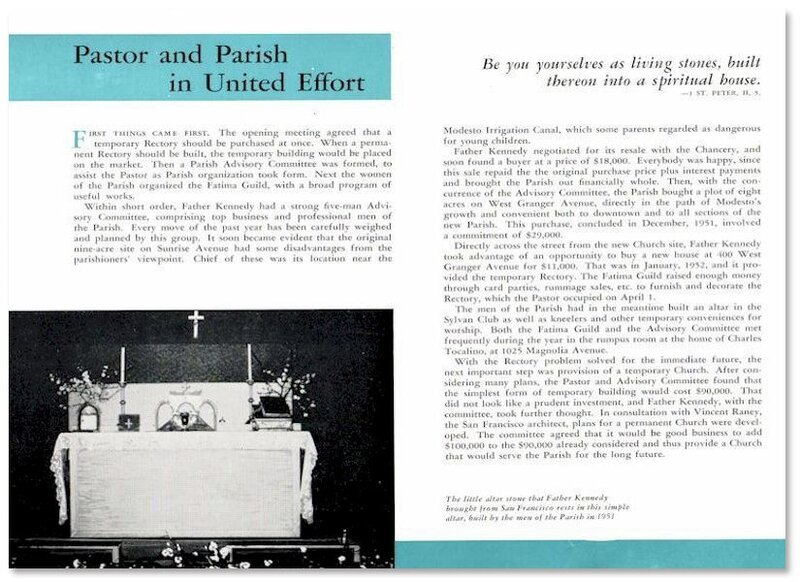 The a Parish Advisory Committee was formed, to assist the Pastor as Parish organization took form. Next the women of the Parish organized the Fatima Guild, with a broad program of useful works. Within short order, Father Kennedy had a strong five-man Advisory Committee, comprising top business and professional men of the Parish. Every move of the past year has been carefully weighed and planned by this group. It soon become evident that the original nine-acre site on Sunrise Avenue had some disadvantages from the parishioner’s viewpoint. Chief of these was its location near the Modesto Irrigation Canal, which some parents regarded as dangerous for young children. Father Kennedy negotiated for its resale with the Chancery, and soon found a buyer at a price of $18,000. Everybody was happy, since this sale repaid the original purchase price plus interest payments and brought the Parish out of financially whole. Then, with the concurrence of the Advisory Committee, the Parish bought a plot of eight acres on West Granger Avenue, direct in the path of Modesto’s growth and convenient both to downtown and to all sections of the new parish. This purchase, concluded in December 1951, involved a commitment of $29,000. Directly across the street from the new Church site, Father Kennedy took advantage of an opportunity to buy a new house at 400 West Granger Avenue for $11,000. That was in January, 1952, and it provided the temporary Rectory. The Fatima Guild raised enough money through card parties, rummage sales, etc. to furnish and decorate the Rectory, which the Pastor occupied on April 1. 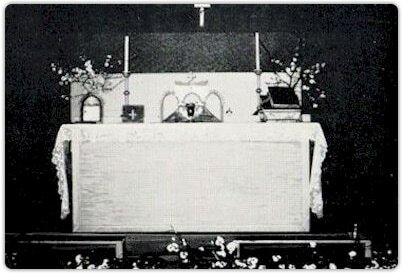 The men of the Parish had in the meantime built an altar in the Sylvan Club as well as kneelers and other temporary conveniences for worship. Both the Fatima Guild and the Advisory Committee met frequently during the year in the rumpus room at the home of Charles Tocalino, at 1625 Magnolia Avenue. With the Rectory problem solved for the immediate future, the next important steps was provision for a temporary Church. After considering many plans, the Pastor and Advisory Committee found that the simplest form of temporary building would cost $90,000. That did not look like a prudent investment, and Father Kennedy, with the committee, took further thought. 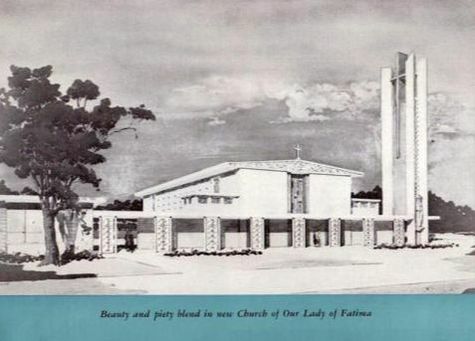 In consultation with Vincent Raney, the San Francisco architect, plans for a permanent Church were developed. The committee agreed that it would be good business to add $100,000 to the $90,000 already considered and thus provide a Church that would serve the Parish for the long future. ​rests in this simple altar, built by the men of the Parish in 1951.